We have been doing a hockey series and reviewing some of the best hockey products out there. Our last review of a HockeyShot product was the HS Slide Board Pro. Now I want to tell you about the HockeyShot HS Passing Kit Junior. 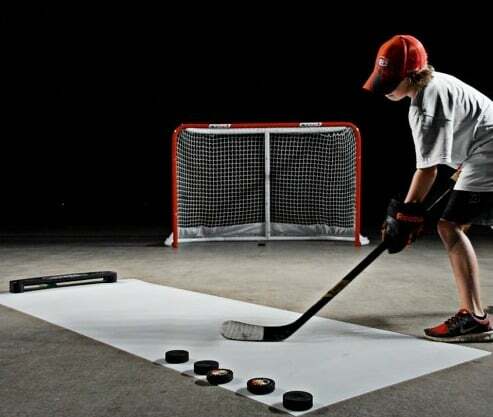 We already have the HockeyShot Extreme Passing Kit that is the larger/adult version of the junior passing kit. Let’s just start of with my video showing the HockeyShot products in action…. I think once you see the above video, I don’t even really need to say how awesome the HS Passing Kit Junior is. Watching the video makes me want to just go have fun training with all my HockeyShot products. Becoming a good passer is the key to becoming a good player, and no training tool drills this better than the HockeyShot Extreme Passing Kit Junior. It will strengthen your little one’s wrists, get them used to receiving the puck and give them the base to improve every aspect of their stick game. It’s light-weight (16 lbs) so it’s easy for kids to set up on their own. The bungee cord construction provides a firm rebound to keep drills going longer. Perfect for off-ice use on any hard flat surface. Face away from the passer to use the roll-up pad as a shooting surface. The passer is a manageable 2’ wide and easily attaches to the 3’ x 8’ roll-up shooting pad. The ultimate training tool for shooting, passing & stick handling drills. The HS Passing Kit Junior is very lightweight and easy to set up. It literally takes only a couple of minutes to set the passing kit up. When not in use, you can take the re-bounder off the shooting surface and roll up the shooting surface for easy storage. Honestly though, we never roll ours up because we use it almost every single day. You can see in my video that we have attached our Extreme Passing Kit re-bounder to the other end of our HS Passing Kit Junior. It allowed us to be able to do some pretty awesome stick handling practice. We also used our HS Slide Board Pro in the video encompassing it into our stick handling training. There is a difference between the HS Extreme Passing Kit and the HS Passing Kit Junior. The differences help you decide which one suits your needs best. The Junior is smaller both in the re-bounder and the shooting surface. So if you have a smaller space for training, you probably want to get the HS Passing Kit Junior. The HS Passing Kit Junior re-bounder actually gets screwed right onto the shooting surface with provided screws. Whereas the HS Extreme Passing Kit has the re-bounder slide onto the shooting surface and tightened down. The way the HS Extreme Passing Kit re-bounder attached is what made it possible to attach it to the other end of our HS Passing Kit Junior. My Little One is 8 years old and having the HS Passing Kit Junior has definitely encouraged her to get stick handling, passing, and shooting. With all her use of the HS Passing Kit Junior, we have definitely seen an improvement in her ability to handle the puck on the ice. 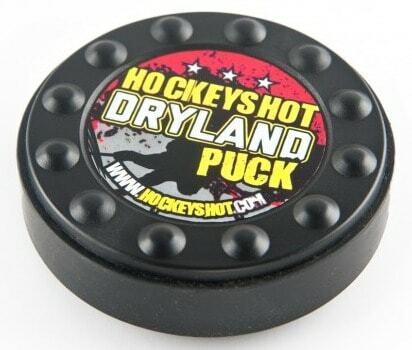 With ordering a HS Passing Kit Junior, you do receive a free product, and we received the HS Extreme Dryland Puck which is perfect to use with the HS Passing Kit Junior. You can even see us using our HS Extreme Dryland Puck in some of the video footage above. If you have a hockey player in the house, then you have to check out HockeyShot and all their training products. When MomMomOnTheGo needs hockey training aids, she turns to HockeyShot. HockeyShot has everything you can think of for hockey training, they provide awesome customer service, and shipping is fast. To take a look at HockeyShot and all their awesomeness, check them out here…..